The Journal of Neurobehavioral Sciences (JNBS) is a referred, neurology journal that is free of charge. All publication costs are sponsored by Üsküdar University Publications and the Humanitarian Values and Mental Health Foundation. Every subject in The Journal of Neurobehavioral Sciences is specially prepared and this area provides a general overview of important areas of neuroscience from molecular level to behavioral level, providing original articles, corner writings, comments and communication from leading researchers. The journal is far-reaching. It encompasses molecules with behavioral (eg. cognitive neuroscience) and clinical (eg. molecular neuroscience, biochemistry) aspects through many disciplines and systems (eg. neurophysiological, neuroscience systems). The journal covers all areas of neuroscience with an emphasis on psychiatry and psychology, as long as it describes neural mechanisms underlying the target normal or pathological behavior. Preclinical and clinical studies are considered to be equally acceptable for publication. Articles about computational modeling methods of psychiatric and neurological disorders and treatment outcomes attract our attention. The journal gives special importance to psychiatric and neurological disorders. However, studies on normal human behavior are also taken into consideration. Work on animals and technical notes should have a clear relevance and applicability to human diseases. The Case Reports containing current neurological treatments or diagnostic methods are generally covered by JNBS. The average time from the delivery to the first decision is less than 30 days. Accepted articles are published online on average in 40 business days prior to printing and the articles are published in print 3-6 months after acceptance. • Reviews: The structure and function of the nervous system should be studied in all its aspects. Editors are waiting for your suggestions to review specific topics. 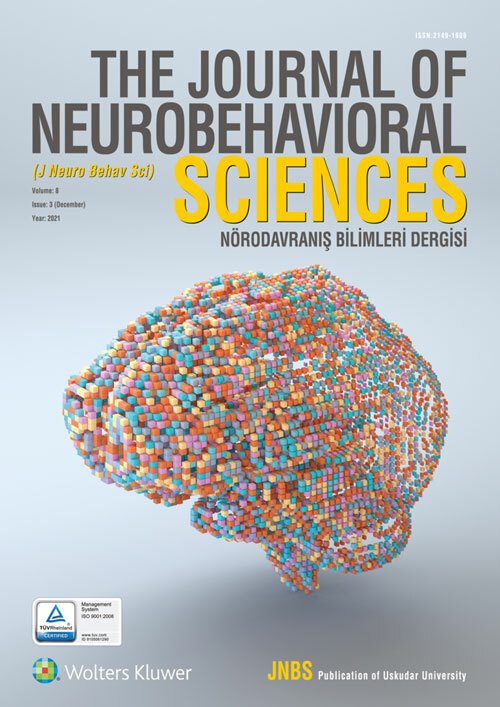 he Journal of Neurobehavioral Sciences - JNBS is the official, scientific and open-access publication of Üsküdar University, which has original works on all areas of neuroscience. All submitted texts / articles are passed on in detail to our editorial team, which consists of distinguished researchers and contributes to our magazine by distinguishing valuable time. It is an honor for us to invite qualified scholars like yourself to publish their qualified work in text / article to support the global science community. JNBS is currently indexed at Google Academic (Schoolar) and Scopemed and is currently being reviewed and evaluated by other prestigious international databases and catalogs. The Journal of Neurobehavioral Sciences is prepared and published free of charge. All publications and printing costs are covered by the publications of Üsküdar University and the sponsorship of the Humanitarian Values and Mental Health Foundation. Text accepted three weeks before the printing date of the current issue is published online before the printing format and immediately after being accepted. The journal is published in English, so texts written in English are being evaluated. Full-text archives as well as descriptions for authors and detailed information on the journal can be found on the website of the magazine: www.jnbs.org. To send articles, you can visit www.jnbs.org. We look forward to your valuable participation and thank you in advance for your contributions. Implicit reviews are optional and it is especially desirable to add them to the cover letter during delivery. For implicit reviews, the article must contain a separate title page with the names and links of the authors, and they should not be anywhere else in the article. The footnotes describing the authors should be written on a separate page. Ensure that there is no clue as to the identity of the authors in any part of the article. If your article is masked research, make sure that the last version contains a line with the author's name for the string and a full author note. • Short Reports, comments, case reports and mini-examinations must not exceed 4,000 words in total length. This limitation includes all of the article except the figures (title page, abstract, text, references, tables, author notes and footnotes, attachments, figure titles). Short reports can also contain a maximum of two figures. For short reports, the length limit is precise and must be applied accordingly. • The total length of Regular Articles should not exceed 6,000 words (except figures). • The reviews are published in the regular reviews of the JNBS. Reviews should not exceed 10,000 words (except figures). o Is the current study a new analysis of previously analyzed data? If so, explain the differences in the analytical approach. o Is some of the data in the current study analyzed for the first time? If so, describe the data (structures) that have not been previously published or edited. o Are there published or edited articles directing the relevant questions from this data set? If so, provide quotations and define the unique contributions of the article you are writing and the degree to which it overlaps. • Request for implicit reviews; a statement assuring that the text is prepared in accordance with these rules. Authors should also specify the total word length of the article (including all elements of the article except figures) and the number of tables, figures and additional items included. Prepare drafts according to American Psychological Association Publication Guide (6th edition). Review the APA's Submission Checklist before submitting your essay. Write the entire copy double-spaced (with spaces). Table preparation, figure, reference, metrology and summaries and other format instructions are available in the Manual. We strongly recommend MathType (third-party software) or Equation Editor 3.0 (not in Word 2007 and Word 2010, which is included in the pre-2007 version of Word) to create your equations The equation software supported in Word 2007 / Word 2010 is low-resolution and errors can occur while being re-edited. • Go to the Text section of the Insert tab and select the object. • Select MathType or Equation Editor 3.0 in the popup menu. If you have a Microsoft Word 2007 or 2010 made by the equation and you have a full version of MathType version 6.5 or later, you can convert it to MathType by clicking on the MathType Equation Insert. Copy the equation from Microsoft Word and paste it into the MathType box. Verify that your equation is correct and press Update. Your equation has now been inserted into your Word file as a MathType Equation. Use Equation Editor 3.0 or MathType only for formulas or formulas that cannot be made as Word texts using the Times or Symbol font. Use the Word table function when creating tables. Using spaces or tabs in your table will cause problems and result in an error. All drafts should be an English written summary on a separate sheet of maximum 250 words. In summary, please write 5 keywords or a short group of words. For those who are Turkish native speakers, JNBS is the summary and the Turkish language of the key words. This is not necessary for non-native speakers of Turkish and the translation will be free of charge. Write references in alphabetical order. Each listed reference should be cited in the text (Name, year, type) and each citation should be in the References section. • For two or fewer authors, type the name of all authors (eg. Brown & Tas, 2013). or three or more authors, type the first author's name and add “et al.” (eg. Uzbay et al, 2005). • Use semicolons (;) for multiple references belonging to the same item and use chronological sorting. References from the same author of the same author should be separated using letters (eg. Smith, 2001a; Smith, 2001b). • Use citations of accepted articles as 'at the press', include them in the reference list. • Use only the texts of the authors' initials and surnames as 'unpublished data 'in their unpublished, preliminary and under investigation studies and add to the reference section. Rogers, T. T., & McClelland, J. L. (2004). Semantic cognition: A parallel distributed processing approach.Cambridge, MA: MIT Press. Graphics files are accepted if they are prepared as Tiff, EPS, or PowerPoint files. Multipanel shapes (ie; shapes with sections labeled a, b, c, d, etc.) must be assembled in a file. The minimum line thickness for the line should be 0.5. Authors are required to state that they are in compliance with the Helsinki Research Ethics Declaration or describe the details of treatment in the treatment of their sample.